Austrian Steering Committee visits the U.S.
After a unique and inspiring kick-off in Boston, the WDLS-EU Steering Committee was warmly welcomed in Washington D.C. at the Austrian Embassy by Deputy Chief of Mission Andreas Riecken and Alice Irvin, Director of the Austrian Press and Information Service. 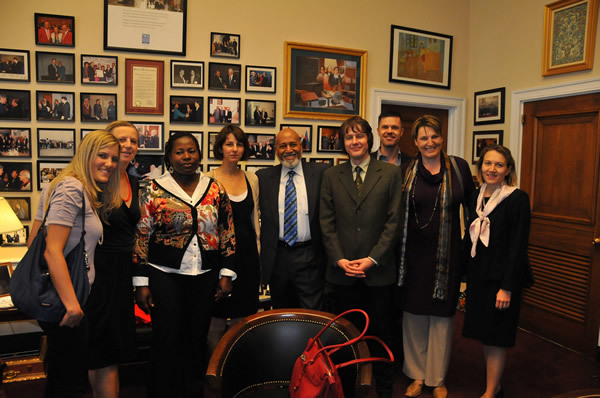 The WDSL Steering Committee with Congressman Alcee L. Hastings. Photo: U.S. Helsinki CommissionRepresentatives from over 15 leading Diversity Think Tanks in the U.S. and executives based in DC and New York joined the Austrian delegation at the Embassy for two sessions of highly reflective exchanges of experiences, good practices, challenges and trends in Diversity and Inclusion policies from European/Austrian and American perspectives. During the talks, participants acknowledged the importance of such an enriching exchange and the enormous learning processes it offered. Both groups agreed on the different approaches, as well as trends and practices of Diversity and Inclusion between Europe/Austria and the US. Moreover, participants strongly acknowledged the need for more round tables of this kind as they offer great learning opportunities for both contexts and expressed great interest in continuing the exchange in the near future. The Austrian Embassy in DC, having assisted in the talks and having realized the great added value created by them, showed great interest in facilitating future Think Tank exchanges.